3 3/4"x10 1/2" trimmed original color ad from 1969 for "Playtex Self Adjusting Tampons". 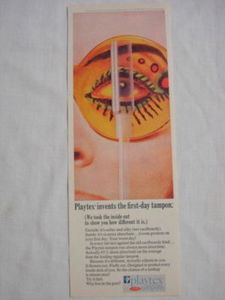 "Playtex invents the first-day tampon". This ad is in good condition. 1932 Kleenex Disposable Tissues Ad "Revolting!" 1909 Ad The Gem Hair Tonic Sprayer, Rochester, N. Y. Copyright adstocollect.com. All Rights Reserved. eCommerce Software by 3dcart.